Please help us continue to communicate the Word of Jesus and His Way of Nonviolent Love with valuable "FREE" resources like those found in our Resources section by making a donation . You can also donate through Giving Assistant! 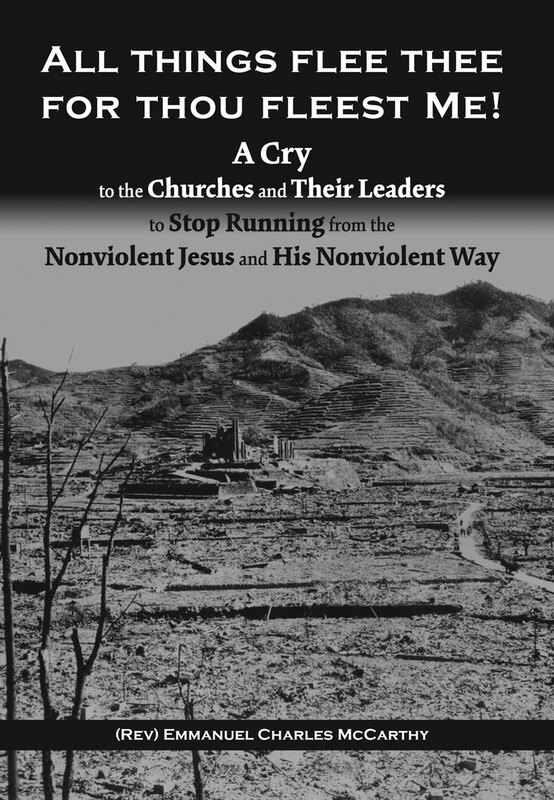 It has been this author’s experience for over seventy-eight years of Catholic Christian life and for over fifty years of teaching that any rigorous critique of the moral validity of Christian Just War Theory (CJWT), is not only not respected in the Churches but is actually systematically pushed out of the ordinary catechetical and pastoral ministries of the Churches. All informed discussion of the possibly fundamental moral illegitimacy of CJWT is almost universally ignored in the catechesis of the Churches from pre-school to adult continuing education. Those Christians who hold economic, political, catechetical and coercive power in the Churches calculatingly and continuously brush off the concerns addressed in this book as unworthy of moral consideration. Marginalization by trivialization is the standing order of the day in most Churches where the incompatibility between following Jesus and engaging in war is the issue. However, you my reader, unlike the vast majority of Christians who have ever lived, can read. You can read what Jesus says and does. You can read what every micro-act of violence in war causes within its victim and its executioner. You can read about what war really is and how wars are really started, as opposed to the illusions and lies that the political and religious propagandists for war calculatingly offer up as truth for mass consumption. You can then ask yourself in the chamber of your own conscience—where you are alone before God—if what these Christian Just War Theories demand and permit in thought, word and deed, are compatible with what Jesus morally permits, indeed with what He imperatively commands, for those who call Him “Lord.” The secondary purpose of this book is to supply you with an acute and relentless critique of CJWT and its dreadful implications and consequences for Christians, their Churches and for all humanity. Its primary purpose is to invalidate forever CJWT as a theological and moral option in a Christian’s life and in the life of the Churches. Just War Theories have existed for over 2000 years. They did not, however, contaminate Christianity until more than three hundred years after Jesus’ Resurrection. Ambrose and Augustine first brought them into the Church. In fairness it must be acknowledged that by the time these two politically powerful bishops released the perpetually-mutating moral virus of CJWT into the Christian community, the Church had, by its choices in favor of acquiring wealth and political power, lost just about all of the spiritual immune system that had protected it for three centuries from the moral pathogen of “righteous” homicidal violence. Over the last 1700 years no effective method has been found to restore the Church’s spiritual immune system against the diseases of “holy homicide” and “ justified Christian homicidal enmity.” If anything, the Church’s immune system against this spiritual pandemic has, by this Third Millennium, completely collapsed. Today, no form of state homicidal violence and no amount of state homicidal violence is beyond the Church’s ability to tolerate, to justify and to allow its membership to execute. The essays in this book are concerned with Christian Just War Theories, not with just war theories in general. These essays are ordered with a logic that is the fruit of teaching this subject for over fifty years. While each essay is understandable in itself, accepting the order in which they are presented should enhance the reader’s understanding of each individually as well as understanding the integral unity of each to all. While none of these reflections is more difficult to read than the editorial page of a newspaper, all should be read with a pencil in hand. The old dictum, Studium sine stilo somnium est, “To study without a pencil is sleep,” is à propos here, because the content of each reflection will ultimately be mirrored in the content of all other reflections.